Atlas F1: The Season's Defining Moment? Formula One racing is a truly remarkable sport, not least for its astounding consistency. There are eleven different manufacturers, eleven unique designs, eight different engines, two tyre manufacturers, and twenty-two drivers of vastly differing experience and background. Yet all are squeezed comfortably into a seven percent performance differential - from richest to least rich, talented to less talented, fortunate to unlucky. On tracks which would take the best part of an hour or more to walk, the difference between legend and journeyman lies literally in the blinking of an eye. It's a game decided by milliseconds, millimeters and grammes, in which cars are purpose-built to last one full race distance and no more. A perfect racing car should expire as it crosses the finish line. During Sunday's Spanish Grand Prix, McLaren and Mika Hakkinen stopped one agonising lap short of that standard. It's been a long time since we've witnessed such a dramatic last lap. Even in the most one-sided of Championships, the sight of Hakkinen's stricken McLaren being passed by Schumacher's ill-handling and slow Ferrari would be etched in the memory forever. In the context of the 2001 season, the ramifications are potentially Championship-deciding. Virtually each season is marked by a single seminal and defining moment, in which the year-long battle for supremacy was ultimately swayed. In 1986, it was Nigel Mansell's Williams careening wildly down the straight, sparks showering off the exposed rim of the burst rear tyre. In 1989 and 1990, it was the infamous Alain Prost/Ayrton Senna shunts at Suzuka. In 1998, the most enduring memory was of Schumacher launching into the back of David Coulthard's McLaren in the wet at Spa. All of these events had a profound effect on the year's WC battle and, in future years, we may well look back on Hakkinen's last-lap clutch failure as the key moment of the 2001 campaign. Of course it's way too early to write off Hakkinen's chances yet, but the fourteen-point swing in arch-rival Schumacher's favour is a severe body blow for the Finn. Once again, the 2001 season draws precedent from the season of exactly a decade ago, 1991. Sunday's Spanish GP was the fifth race of the year. In the fifth race of 1991, the Canadian GP, Nigel Mansell had the race sewn up before electronics failure relegated him to sixth on the final lap. At the time, it seemed insignificant. After winning the opening four races of the year, Ayrton Senna led the Championship by 29 points and looked unstoppable. With two races to go, Mansell had cut that lead to 16 points. The 9 points lost at Canada would have placed Senna under greater pressure later in the season, and may have proved critical. Mindset and confidence are key elements in any driver's performance, and Hakkinen now finds himself in uncharted territory. Last season, he stunned all by coming back from a seemingly hopeless position to catch and briefly lead Schumacher in the World Championship race late in the season. But then, his biggest deficit during the season was 24 points. This year, the gap already stands at 32 points. It took a freak run of three successive Schumacher retirements to allow the Finn back into the title chase in 2000. It's extremely unlikely that the reigning Champion will be as accommodating again. Fans and the media have drawn positive sentiments from Hakkinen's race, with pronouncements such as 'Hakk's Back!' and 'Moral Victor'. Neither is entirely true. Regarding the 'moral victor', Hakkinen had ostensibly snatched the lead with a piece of Ferrari-esque tactical brilliance, by staying out for several laps longer than Schumacher before his second pitstop. In the pre-2001 days of rock-hard grooved tyres, light fuel load was the key to fast laps. If a driver stopped later, he got the benefit of the extra laps in an ultra-light car, while his earlier-stopping opponent struggled along under a cumbersome fuel load. At Barcelona, the abrasive track surface evens out the rubber/fuel load equation, and Schumacher recorded the fastest lap of the race a mere two laps after his first stop, in a heavy car but with fresh rubber. If Schumacher's third set of tyres had performed the same as the first two sets, Hakkinen would not have stood a chance of gaining track position. Martin Brundle was totally right when he dolefully proclaimed 'McLaren don't have any tools left to try and get Mika in front' immediately before Hakkinen's second stop. Making up four seconds in six laps, against a driver who had set the fastest lap of the race on a heavy fuel load, was never on. 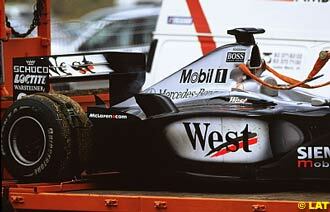 The lead, when it came, was gifted by Schumacher's tyre woes. McLaren had not out-strategised Ferrari. On the contrary, they ran a slightly heavier car for the first two stints, with the subsequent slower pace. Naturally Hakkinen would have taken the ten points gratefully, as did Schumacher. Fellow driver sympathies aside, they are both hardened professionals who are out there to win, and they'll take the points however they come. The 'Hakk's Back' headlines arose from superficial scrutiny of the pre-Spain Championship tables rather than evaluation of the Finn's performances in the cockpit. In Australia, Hakkinen was running a comfortable second in a decidedly inferior car before suspension failure pitched him into the barriers. Malaysia's half-wet, half-dry conditions have never been the Finn's strong suit, although he did record a scorching fastest race lap, half a second faster than Schumacher's, once the track had dried. At Brazil he was a non-starter, and a poor start at Imola left him stranded behind Jarno Trulli's Jordan for much of the race. Starting has been the only blot on Hakkinen's copybook this season. In clear air on a dry track, the Finn hasn't lost a millisecond. The qualifying results are the clincher. Hakkinen has out-qualified teammate David Coulthard four races out of five so far. If the Finn can stamp that sort of authority over the 'new and improved' Coulthard, there's not much wrong with his form. For Hakkinen's main championship rivals, Michael Schumacher and David Coulthard, Spain must have proved a troubling race as well. Both left with more points than they would have envisaged five laps from the end, but that is cold comfort. For seemingly the umpteenth time, Schumacher dazzled for two race stints, only to limp home in the third with wheel-related problems. Every driver gets the odd set of dud tyres, but none with the regularity of Schumacher. For Coulthard, Spain produced another gem of a drive that saw him go from stone last to eventual fifth. He must be cursing his luck, though: with Hakkinen and Schumacher's problems, that could and should have been first position. The formation lap stall is the first black cloud on what have been sunny skies for the Scotsman this season. McLaren chief Ron Dennis's hasty and wrongful pronouncement of driver 'brain fade' could not have done much for Coulthard's morale either. Although Dennis did publicly retract the statement later, the damage had already been done. Amidst all the last-lap drama, the reintroduction of legitimate traction control went almost unnoticed. If anybody was expecting traction control to make a measurable difference in terms of competitiveness, they were sorely disappointed. Apart from Williams's problems integrating traction control into their BMW/Michelin package, the driver and team hierarchies remained essentially unchanged. Traction control is not some mystical techno-magic that bunches up the field and levels out differences in talent or machinery. When traction control was last legal in the early Nineties, the cream of the crop (Senna, Prost, Mansell) still rose to the top. On Sunday, Michael Schumacher and Mika Hakkinen proved that nothing has changed. Even with the best of driver aids, driver skill is still paramount in Formula One.